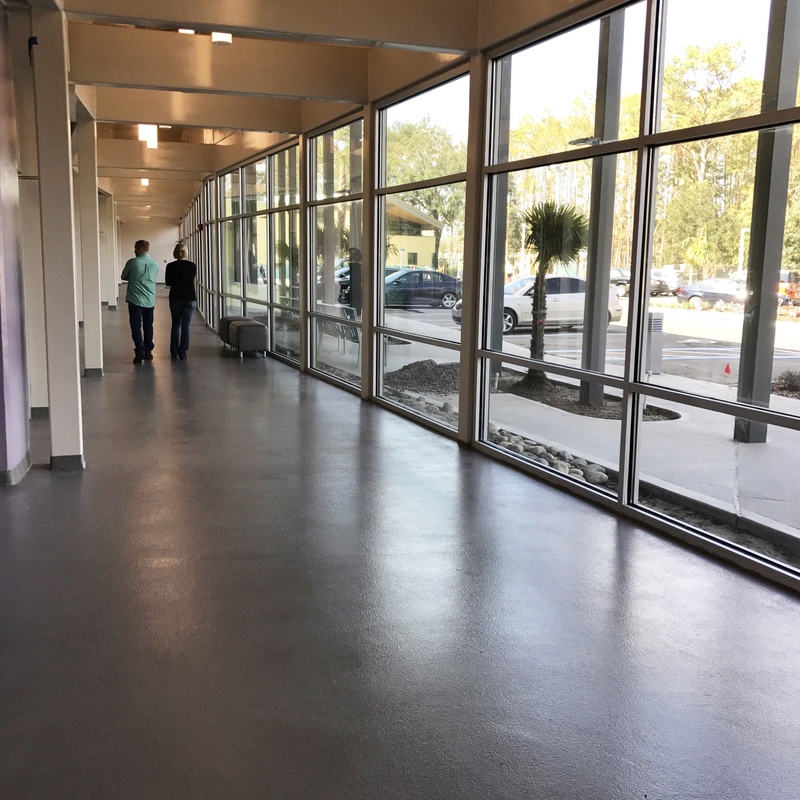 The Jacksonville Humane Society: Plexi-Chemie Coatings Create Functional and Beautiful Floors for the Newly Rebuilt Adoption Center – Plexi-Chemie, Inc. In the fall of 2017, the Jacksonville Humane Society opened its new $15 million state-of-the-art adoption center. The new facility, which was mostly paid for by generous donors, is beautifully designed with spacious kennels, visiting rooms, a large veterinary area and staff offices. This no-kill adoption center stands on the same property as the facility that was destroyed in a devastating fire in 2007. Since that time, the Humane Society operated out of temporary buildings and the one kennel that survived the fire. Plexi-Chemie was proud to play a role in the process and was tasked with providing flooring systems that are durable, decorative and easy to clean and maintain. A total of 30,000 square feet of PlexiChemie products were installed at the Jacksonville Humane Society. Three flooring systems were applied: PlexiChip, PlexiGlaze Metallic and PlexiQuartz. The PlexiChip system was installed in the kennel areas and made up the majority of the flooring applied. The tan flooring system was a custom color match that was selected by the designers of the new building. The PlexiChip floors provide a beautiful terrazzo-like appearance with the benefits of a seamless floor. PlexiChip is scratch and impact resistant and can stand up to exposure to liquids and chemicals. This is imperative for the Jacksonville Humane Society facility, especially in the kennel areas. PlexiChip floors require no waxing and are easily cleaned. Long-term care of PlexiChip floors can be done with renewed additional topcoats. In this particular situation, the desired texture of the PlexiChip system was on the smoother side; however, the product does allow for varying degrees of slip resistance. For the lighter-use commercial areas, such as the front waiting area, staff offices and animal viewing rooms, PlexiGlaze Metallic was used. 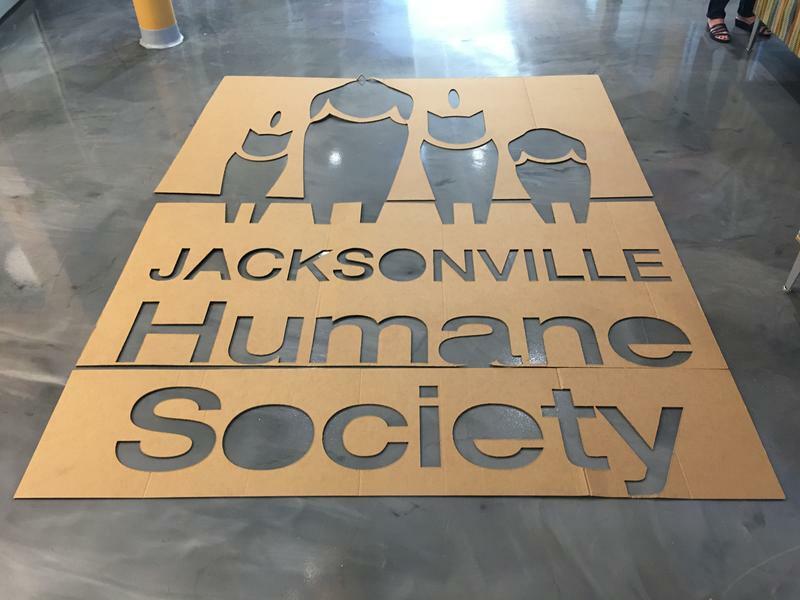 PlexiGlaze Metallic provides durability and is also highly decorative, complementing the architecture and high ceilings of the newly built Jacksonville Humane Society. This resinous flooring system was comprised of custom gray-colored metallic pigments incorporated into clear PlexiGlaze #4. It is attractive, very durable – especially in areas that see a great deal of foot traffic – and has a smooth texture. PlexiChemie’s PlexiQuartz system was installed in the front hallway of the facility. This all-gray quartz floor goes right up to the main waiting area, and the gray tones of each system complement one another. PlexiQuartz is a durable and decorative, 100% solids, clear epoxy resin and colored quartz aggregate flooring system. The inorganic naturally occurring quartz granules are color-coated using state-of-the-art ceramic coating technology for lasting color stability. This slip, abrasion and impact resistant flooring was the perfect choice for the front hallway, especially since this area has a large amount of foot and animal traffic. PlexiQuartz can also withstand exposure to liquids and chemicals. 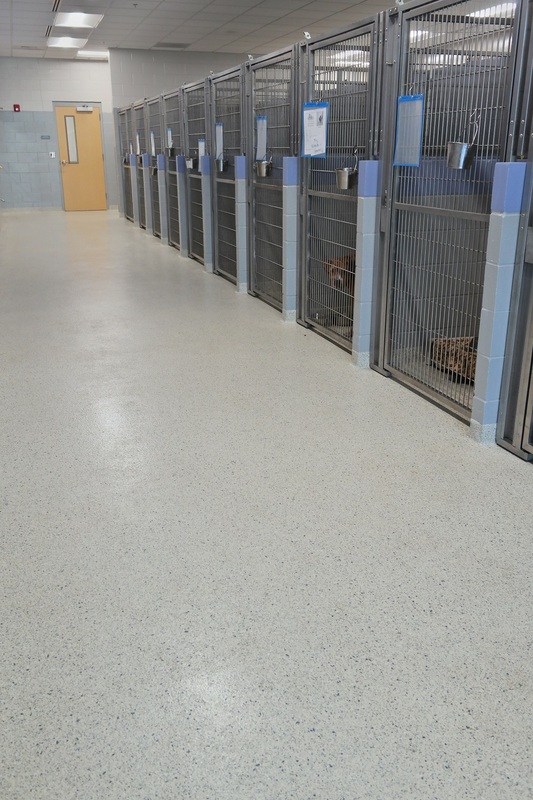 At the end of the job, the Jacksonville Humane Society was thrilled with their functional, durable and decorative floors. Using the right products for each unique situation is important for the long-term durability of a flooring system, and this job really illustrates this point. With the combination of the PlexiChip, PlexiGlaze Metallic and PlexiQuartz systems, the decorative desires of the facility’s designers were met, as well as the functional requirements of a busy animal adoption center. All in all, the trio of durable and decorative PlexiChemie products will aid the humane society in focusing on animal care and adoptions instead of flooring system maintenance and repair.